While most of us tend to wait until Thanksgiving to say thanks, Hot Roxx cannot wait another day. The night before the holiday, join us in thanking the spirits for more than four decades of Fleetwood Mac! Fleetwood Magic: A Tribute to Fleetwood Mac will feature some of the finest musical luminaries of the Twin Cities including Red Daughters, Just Perfect (aka Brian Just Band), Meg Ashling, Pleather and Lace (aka The Chambermaids), and Robust Worlds paying tribute to the greatest band in human history. Saturday Morning Cartoons with Booka B playing records all morning. Stop in for brunch, peruse the goodies on sale from Fifth Element, and pick up a pair of tickets to Rhymesayers 20th Anniversary Show at Target Center on Friday, December 4. 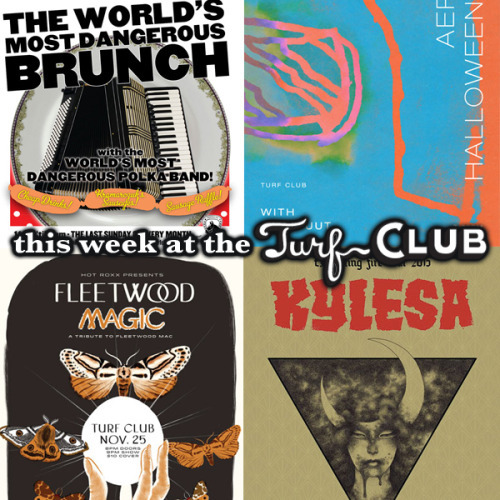 Tunes 'N Toons 10AM-2PM, Serving Brunch 10AM-3PM. Kids welcome! Break out the Justin Vernon family tree! Aero Flynn is the project of Josh Scott, a musician whose old band Amateur Love shared members with Vernon’s old band, DeYarmond Edison, more than a decade ago. (Specifically, the two bands shared future Megafaun members Brad and Phil Cook and Peter Wolf Crier’s Brian Moen.) Scott is revered in the Wisconsin music scene that yielded Bon Iver, Volcano Choir, Field Report, and so many other great bands. And after years in obscurity, he might finally be ready for his spotlight moment. Field Report’s Chris Porterfield, who was also in DeYarmond Edison, fills in the backstory in a lengthy post on Aero Flynn’s website, but the gist is this: Amateur Love was viewed as the better band back in ’02, and the series of events that led to Bon Iver’s genesis might never have happened if Scott hadn’t blown up Amateur Love and allowed his bandmates to focus on DeYarmond Edison, whose move to North Carolina and eventual burnout sent a defeated Vernon into that lonely Wisconsin cabin to make his masterpiece. Also, that line in Bon Iver’s “Holocene” about “Lip Parade” is a reference to one of Scott’s songs, contrary to what the geniuses at Genius think. Back to Scott, though. Apparently he had a second chance to sign a record deal and pursue a music career after Bon Iver blew up, but he balked again. Something must have changed because it looks like he’s finally going for it. Now based in Minneapolis, he’s assembled a touring lineup and is about to release a self-titled album as Aero Flynn. Halloween, Alaska took root in the early '00s as a semi-electronic diversion from its members' primary rock/jazz projects (The Bad Plus, 12 Rods, Love-cars, Happy Apple, et al). A self-titled debut album made sufficient waves to inspire more recording, more shows, more expenditures, more experimentation. Over the course of three more albums, a string of US/UK tours and couple of lineup changes, the group has continued to expand its palette outward from a dedicated core of arty, ambient rock. As of 2015, the band is completing a fifth full-length album in its hometown of Minneapolis in collaboration with engineer/producer Brett Bullion.